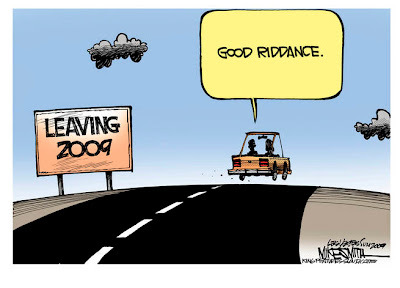 THIS CARTOON FROM THE LAS VEGAS SUN NEWSPAPER PRETTY MUCH SUMS UP THE "GLOOM AND DOOM" OF THE NEVADA ECONOMY. I LOOKED BACK IN THE LAST BLOG TO THE 1930'S AT THE, WHEN AND HOW, NEVADA CAME BACK FROM THE DEPRESSION. I SOUNDED LIKE A GRANDPA TALKING ABOUT THE OLD DAYS WHEN WE WALKED TO SCHOOL IN THE FREEZING SNOW 6 MILES UPHILL BOTH WAYS. IN TODAYS REAL WORLD, THE BIGGEST PROBLEM IN THE NEVADA ECONOMY IS LACK OF WATER IN TEN YEARS. THE CHALLENGES OF TODAY IN NEVADA INCLUDE INTERNET GAMING AND BEING IN ON THAT, A HIGH SPEED RAIL SYSTEM FROM CALIFORNIA TO BRING THE CUSTOMERS TO VEGAS, THE PRODUCTION OF SOLAR AND WIND ENERGY, AND ATTRACTING THE HIGH TECH BUSINESS THAT WOULD LOVE TO LEAVE THE STRAPPED ECONOMY OF CALIFORNIA. THE CORRECTION IN HOUSING PRICES AND REAL ESTATE ALSO PRESENT AN OPPORTUNITY TO ATTRACT THE BABY BOOMERS INTO RETIREMENT IN THE FUN AND SUN OF NEVADA. THERE DOES THAT GET ME BACK INTO THE PROPER FRAME OF MIND FOR THE NEXT DECADE? AND WELCOME TO TWENTY TEN !!! THE FALL “TO DO” LIST IS LINGERING OVER TO WINTER. I’VE GOT A LIST OF BAD EXCUSES, BUT I’LL SKIP LYING TO YOU FOR TODAY. BESIDES WAXING THE CAMPER, THERE ARE STILL ABOUT THREE OR FOUR OTHER ITEMS TO DO. WILL IT EVER END? I LIKE SPRING BETTER, WHEN THE ONLY THING ON THE LIST IS TO WAX THE PICK-UP, BUT THE WAY IT’S GOING, IT’S GOING TO BE THE FIRST OF APRIL AND TIME FOR THAT CHORE. WE’VE BEEN HANG’IN LOW, PUTTING IN OUR SHARE OF HOURS AT WORK. WE SLIPPED OFF TO LAUGHLIN RECENTLY, AND SAW THE MOVIE “BLIND SIDE” WITH SANDRA BULLOCK. OTHERWISE OUR DAYS OFF HAVE BEEN COOKING OUTSIDE, AND FOOTBALL ON TV. THE “GLOOM AND DOOM” OF THE NEVADA ECONOMY STILL HASN’T HIT BOTTOM. BACK IN THE 1930’S THE STATE OF NEVADA CLIMBED QUICKLY OUT OF THE DEPRESSION WITH GAMBLING, QUICKIE DIVORCES, AND TOURISM. MAYBE NOW IS THE TIME FOR NEVADA TO EXPAND ON “SIN” AND PROMOTE MORE PROSTITUTION, AND LEGALIZING POT TO SMOKE. RELAXING PERSONAL FREEDOM LAWS MAYBE JUST WHAT NEVADA NEEDS TO BOUNCE BACK, HELMETS, SMOKING LAWS, GUN CONTROL, POT, GAY MARRIAGE, SPEED LIMITS, DUI OF 1.8, ETC. LET’S PUT THE “WILD” BACK IN THE WILD WEST, MAKE SOME MONEY, AND LET THE PEOPLE DECIDE WITH THEIR CHECKBOOKS WHAT THEY REALLY WANT. Susie Q loves to walk around on my desk. See that cute little calendar date in the corner of my screen? I love it, I am always wondering what day it is and if I click on it I can see the whole month!! How cool is that?? Anyway Susie, I have no idea which key you hit to get this on my laptop screen but I really like it. Thank you Susie Q!! It was the a really nice Christmas gift. P.S. Did anyone read the comments on the blog about the grocery carts? Someone used the word-anencephaly in their comment. Since I was not familiar with that word and I love words, I looked it up. It means “congenital absence of all or a major part of the brain”. Just a FYI tidbit. We want to take this opportunity to wish one and all a very Merry Christmas!! 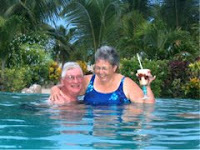 Also our sincerest wishes for a healthy, happy, and prosperous 2010 for us all. Does this look like Christmas to you?? It doesn’t look like Christmas to me either. This is why I just can’t get into the Christmas spirit. Christmas should include family and snow (as much as I hate it). If I didn’t have a calendar and hear people wishing each other “Happy Holidays”, etc., Christmas would entirely escape my notice. It doesn’t help to always have to work on Christmas Day either. The last two years Rex’s Mother was here during Christmas, but this year she decided not to come to Arizona so we don’t even have her to visit. I THOUGHT ONLY NURSES AND DOCTORS GAVE YOU SHOTS. RECENTLY I’VE I HAD A HOST OF PEOPLE GIVING ME SHOTS. AT THE DENTIST OFFICE THE LAST FOUR MONDAYS, MY DAY OFF, I’VE HAD THE DENTAL HYGENIST GIVING ME MULTIPLE SHOTS OF NOVICANE. THE LAST TIME, SIX YEARS AGO, I HAD THIS ROOT PLANEING, OR DEEP CLEANING DONE, THE DENTIST GAVE ME THE NOVICANE, AND THEN THE HYGENIST DID HER THING. THEN AT WORK WE LINED UP FOR OUR ANNUAL SEASONAL FLU SHOT, AND IF IT WAS A NURSE THAT GAVE ME THE FLU SHOT, WELL IT HAD TO BE CASUAL FRIDAY THE WAY SHE WAS DRESSED. THEN IT WAS OFF TO WALGREENS DRUG STORE TO BUY A SWINE FLU SHOT FOR $18. FIRST THE COUNTERMAN IN BROKEN ENGLISH TELLING ME TO FILL OUT THE PAPERWORK. THEN HE ASKED ME TO WAIT IN THE WAITING AREA. I THOUGHT I WAS WAITING FOR THE NURSE, AS THESE SHOTS ARE ONLY SOLD ON MONDAYS AND TUESDAYS FOR A FEW HOURS. EVENTUALLY THE COUNTER MAN COMES OUT AND SAYS ROLL UP YOUR SLEEVE. ONLY DOCTORS AND NURSES GIVING YOU SHOTS IS HISTORY. NOW THE ONLY TRAINING YOU NEED TO GIVE A SHOT IS TO WEAR RUBBER LATEX GLOVES, I GUESS. BY THE WAY, THEY HAVEN’T CHANGED THE SIZE OF THAT SYRINGE AT THE DENTIST OFFICE, IT STILL LOOKS LIKE THEY BOUGHT THEM FROM A VET SUPPLIER. Did you notice all of the “Hoy, Hoy, Hoys” on the blog this week? I have 5 grand daughters. Three of them have “M” as their first initial AND also have their birthdays this week. Is that poor planning or what? Oh hell it might be OK…at least if the birthdays come in clusters, I can’t forget them. I have been reading book on PMA-positive mental attitude and have started looking at the silver lining instead of the cloud. It’s a nice change of pace. I went to Wal-Mart the other day and happened to have the camera in the car so I decided to take pictures of and write about one my pet peeves. I absolutely have a fit about people not putting their carts in the cart corrals. This is just pure laziness… you see the cart corral?? It looks to be about 20 steps away. Forget about laziness, what about common courtesy? This one appears even closer than 20 steps. A few years ago one of these runaway carts slammed into my car and cost me $600 to get it fixed…at the time my car had 7,000 miles on it. Good thing that was a while ago….finding a silver lining in that situation would have been impossible!! Tis the season….The Salvation Army bell ringers with their red buckets are out. I did find this picture really interesting—no bell ringer but a purse hanging on the post. If you closely at the waste container, the bell ringer is sitting behind it. My next question is: Is it her purse? Or did someone donate it? I am trying to follow my tradition of putting $1 in the buckets every time I see one. As I said—Tis the season!! Wii FIT PLUS IS THE GAME MARY WANTED FOR EXERCISE AND WEIGHT LOSS. THE GAME INCLUDES A PLATFORM THAT YOU STAND ON WHILE DOING THE GAMES AND EXERCISES. THE PLATFORM IS ALL KNOWING…….. IT KNOWS IF YOU’RE RUNNING, JUMPING, LEANING, ETC., AND IT KNOWS HOW MUCH YOU WEIGH!! WHEN YOU FIRST SET UP THE GAME YOU FORM A “Mii”, IT’S YOUR AVATAR. HERE ARE THE AVATARS WE HAVE SET UP. FROM LEFT TO RIGHT, THAT WOULD BE SUSIE-Q THE CAT, MARY WITH THE GRAY HAIR, (I have since changed my facial shape, hairstyle, and shirt color). AND REX WITH THE COOL SHADES. THE GAME COMPUTER KEEPS TRACK OF EVERYTHING, INCLUDING HOW MUCH YOU WEIGH EACH DAY, THE NUMBER OF CALORIES YOU BURN EXERCISING, THE NUMBER OF MINUTES YOU ACTUALLY EXERCISES, ETC. THEN IT SHOWS YOU A GRAPH OF YOUR PROGRESS. I'LL GET TO THE GRAPHS AND PROGRESS IN ANOTHER BLOG? WHEN THE Wii VIDEO GAME CAME OUT SEVERAL YEARS AGO AT $399.00 WE TALKED ABOUT IT, EVEN WENT TO THE STORE TO BUY ONE, BUT WHEN THEY WERE SOLD OUT WE LET IT GO. THIS HOLIDAY SEASON WHEN THE GAME WENT ON SALE AT WALMART FROM $249.00 TO $199.00 WE TALKED ABOUT IT AGAIN. I FINALLY DECIDED I’D BUY THE Wii FOR $199.00 AND THEN MARY COULD BUY THE Wii FIT PLUS PART FOR $99.00. OF COURSE I PUT IT OFF AND DECIDED THE SECOND TO LAST DAY OF THE WALMART SALE. I WENT TO WALMART AFTER WORK IN THE MIDDLE OF THE NIGHT. I HAVE A RULE THAT KEEPS ME OUT OF WALMART FROM THANKSGIVING UNTIL MY BIRTHDAY IN MID-JANUARY. THE CLERK, WHICH AT THAT TIME OF THE NIGHT IS ACTUALLY A SHELF STOCKER, HUNTED HIGH AND LOW, AND LUCKILY FOUND ONE LAST Wii UNIT TO SELL ME. WHEN I WENT TO PAY, SHE WAS HAVING TROUBLE GETTING THE COMPUTER SYSTEM TO RING UP MY SALE. SHE CALLED A SUPERVISOR ON THE RADIO, AND THE SUPERVISOR EXPLAINED THAT SHE HAD TO GIVE ME A $50 GIFT CARD TO COMPLETE THE SALE. WHAT!!! ARE YOU KIDDDING ME? THIS THING IS ON SALE FOR $50 OFF AND I GET ANOTHER $50 ON A GIFT CARD? AND I BOUGHT THE LAST ONE? IS THIS MY LUCKY NIGHT OR WHAT? MAYBE I SHOULD JUST HEAD BACK TO A CASINO? AND HAPPY 11TH BIRTHDAY MACKENZIE !!! HOY !!! HOY !!! HOY !!! AND HAPPY 14TH BIRTHDAY MARISSA !!! I FIND FAMILY HOLIDAY TRADITIONS DATE BACK YEARS AND YEARS. MY CHILDHOOD HOLIDAY TRADITIONS CENTERED AROUND GOING TO GRANDMA'S HOUSE. MY GRANDMA WAS CHRISTMAS! SHE HAD THE TRADITION OF PUTTING UP HER CHRISTMAS TREE ON DECEMBER 15TH, HER BIRTHDAY, EVERY YEAR, AND SHE PLANNED AND WORKED ON CHRISTMAS ALL YEAR LONG, SPECIALIZING IN HAND MADE GIFTS TO GIVE. SO WHAT KIND OF HOLIDAY TRADITIONS DOES AN OLD RV GRINCH LIKE REX HAVE THESE DAYS? SO FAR AWAY FROM FAMILY, AND WORKING IN THE CASINO DURING THE HOLIDAYS, THE ANSWER ALLUDES ME. IN FACT I CAN'T THINK OF SINGLE CURRENT HOLIDAY TRADITION. MARY AND I DON'T EVEN SURPRISE EACH OTHER WITH GIFTS. OVER THE PAST YEARS I USED TO BUY A PIECE OF LIMBURGER CHEESE AT CHEESDAYS IN MONROE, SEAL IT IN A JAR, AND KEEP IT IN THE FRIDGE UNTIL THE HOLIDAYS TO ENJOY. OF COURSE I HAVEN'T BEEN TO CHEESEDAYS AND MONROE FOR AWHILE. IMAGINE MY SURPRISE AND DELIGHT WHEN I FOUND A PIECE OF LIMBURGER CHEESE AT MY LOCAL SAFEWAY STORE DELI? THE LIMBURGER MUST HAVE BEEN SITTING IN SAFEWAY'S STORAGE FOR AWHILE AS IT HAD A NICE AGED FLAVOR TO IT. SUSIE-Q, THE CAT, TOOK ONE SNIFF, TURNED UP HER NOSE, AND LEFT ME ALONE. IT WAS THE REAL THING, ALTHOUGH PRIVATE LABELED, IT WAS MADE IN WISCONSIN. THERE IS ONLY ONE CHEESE FACTORY IN THE UNITED STATES THAT MAKES LIMBURGER, CHALET CHEESE. MY OTHER HOLIDAY TRADITION WOULD BE MY WEAKNESS FOR EGGNOG. THANK GOODNESS THIS IS A SEASONAL ITEM, I LOVE IT !!! AND HAPPY 5TH BIRTHDAY MAXINE !!! A couple of weeks ago, I got a new toy. YES!! A toaster oven and the price was absolutely wonderful. FREE!! Our favorite neighbor Steve gave it to us…..he ran out of space and we benefitted from it. So I have been toasting, baking, and broiling up a storm. I’ve made pear bread, cookies, brownies, and garlic bread. So what, you might ask, did I serve with the garlic bread?? Lasagna!! I decided to make the lasagna in vertical rolls instead of layers. I think it cooked more quickly and was easier to serve. Rex liked it that way too so that will probably be the way we do it from now on. 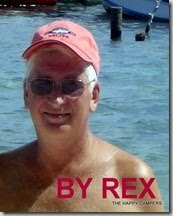 Remember Rex’s famous end line? You know “Sunny & 80”? Well today it was anything but. So what one to do on a day like this??? Just like home, button up at home in your jammies with a big bowl of home made chicken soup!! AN OUTDOOR KITCHEN PROJECT HAS BEEN ON THE FALL “TO DO” LIST. THE PROBLEM HAS BEEN THE WIND BLOWING OUT THE BURNERS ON THE BIG gASS GRILL. WE WERE TIRED OF PLANNING COOKOUTS, ONLY HAVING TO CANCEL OUR MEAL PLANS DUE TO WINDY WEATHER. WE FIGURED OUT WHAT WE WANTED AND HIRED THE LOCAL NEIGHBORHOOD HANDYMAN, MARTY, TO DO THE WORK. THESE WALLS AROUND THE GRILL SHOULD KEEP THE WIND OUT, AND THE BURNERS LIT. YOU’LL NOTICE THE NEW OUTDOOR KITCHEN IS GREEN BAY PACKER GREEN IN COLOR. WE STILL NEED TO ADD SOME HOOKS, AND WE’RE LOOKING FOR THE RIGHT GREEN BAY DECAL TO ADD TO THE KITCHEN. THE SECOND PART OF THE PROJECT WAS TO REPLACE THE GRILL BOX ON THE STOVE. YOU REMEMBER LAST SUMMER IN THE EXTREME HEAT WHEN I PULLED A GARDEN HOSE BY THE GRILL, HOOKED IT, AND IT TOOK A NASTY FALL. THE HINGES WERE SPRUNG, THE HANDEL BROKE OFF, AND THE THERMOMETER STOPPED WORKING. MARY REPLACED THE GRILL BOX AS AN EARLY CHRISTMAS PRESENT FOR ME. THE THING I REALLY LIKE ABOUT THIS GRILL BOX IS THAT THE COOKING GRATE IS BLACK CAST IRON. I USED THE OLD GRATE IN THE NEW GRILL BOX AS IT’S WELL SEASONED CAST IRON. THE CAST IRON HOLDS A NICE EVEN HEAT FOR COOKING. THERE, CROSS OFF ANOTHER ITEM ON THE FALL “TO DO” LIST. HERE’S AN IDEA FOR THOSE RV’ERS SPENDING THE WINTER ON THE DESERT IN THE SOUTHWEST, FLANNEL SHEETS. AFTER NINE YEARS OF CHILLY NIGHTS WE GOT A SET OF FLANNEL SHEETS. ACTUALLY MARY PICKED THEM UP LAST SPRING ON A CLEARANCE RACK AT KOHL’S. THE REGULAR PRICE WAS $85. AND SHE PICKED THEM UP FOR $15. WE GOT THEM OUT LAST WEEK AND SENT THEM THROUGH THE WASHER AND DRYER. NOW THEY’RE ON THE BED AND SURE TO STAY THERE UNTIL SPRING. WE ‘VE SET THE OVERNIGHT TEMPERATURE ON THE THERMOSTAT A FEW DEGREES DOWN AS A BENEFIT TO USING THE FLANNEL SHEETS. THE LAST TIME I REMEMBER USING FLANNEL SHEETS WAS AS A YOUNGSTER, 50 YEARS AGO, DOWN ON THE FARM AT GRANDMA’S HOUSE. Of course you all know that when I go to an “Arts and Crafts” show I don’t just buy one unique item. kaleidoscope. It is not only a beautiful piece of glass art, but it’s fun to look at the marbles in the sunlight. The man that made this had lots of them, mostly made out of wood but the streamlined size of this one made it fit in the camper better. Anyway, I wanted to share this purchase also. I love “Arts and Crafts” shows!! IT’S A ROCK RUG? IN A CAMPER? Well Ricky I was at this cool “Arts and Crafts” show at the Avi this past week end. This lovely rug was there and since I am always picking up rocks and looking for a place to put them, I felt this was the perfect solution. And isn’t it not only cool, but very unique!! I love looking at the individual rocks on this mat (it is actually designed as a welcome mat). They are really cool and so smooth. They must have been tumbled by water at some point in time. I also like the design. The lady that makes these also happens to be the “lady of the house” at the property we stayed at last summer. Another reason for this to be a special piece for me. She said that when these rocks warm up in the sun, it is really relaxing to rub your bare feet over the rocks. That makes sense to me because I enjoy rubbing my feet on these rocks now. So there, is that enough ‘splaing, Ricky? ?